The Russian River Valley extends from Healdsburg to the Wohler Narrows, a set of large rocks which mark the entrance to the lower river canyon. This eight-mile long valley has been an agricultural area for many years, supporting hops, orchards, and vineyards. 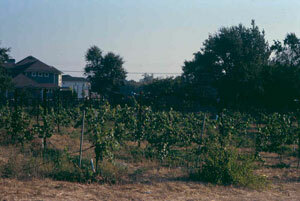 Winegrapes are the primary crop now. The Russian River channel in this valley has undergone significant alteration due to deep pit-mining in the 1970s. A vast amount of gravel and cobble has been removed, resulting in the river channel bottom dropping 22 feet. This significant environmental impact continues to affect aquatic habitat, riparian forest, and tributary streams. 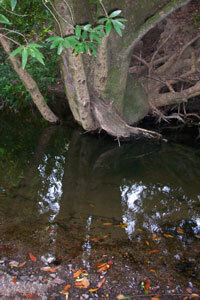 Tributary creeks include West Slough, Lower Windsor, Pool, Pistol, Dry, Lower Mark West, Storey, and Porter Creeks. Canoeists in the Russian River Valley. Note the tall vertical eroding banks. This 10-acre site in the Windsor Creek watershed is owned and managed by Susan and Kenneth Coster, who have worked to remove non-native invasive plants and replant with native species along Starr Creek. Magnolia Ranch occupies 38 acres between West Slough and the Russian River. Channelization of the Russian River and urbanization elsewhere in the watershed is impacting West Slough, creating bank erosion and channel incision. These impacts are being addressed on the site by revegetating the banks with native tree species. 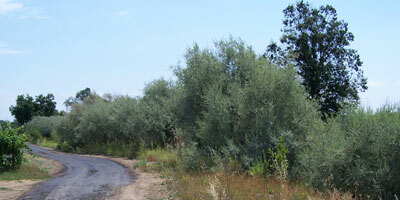 The 129-acre Storey Ranch straddles Storey Creek where revegetation projects are ongoing to increase wildlife habitat. In 2003, Ferrari-Carano received an FFF award for Exceptional Actions and Dedication to Environmental Conservation. The historic Walters Ranch Hop Kiln stands as a symbol of the care, quality, craftsmanship and longevity that goes into every bottle of HKG Estate Wine. The Hop Kiln also serves as our Tasting Room and Marketplace. This structure served the important hop industry of California's north coast region, once the major hop-growing area in the west. Built in 1905 by a crew of Italian stonemasons, it represents the finest existing example of its type. The building consists of three stone kilns for drying hops and an attached wooden cooling barn with a two-story press for baling hops. California Registered Historical Landmark No 893. This 250-acre site includes a large riparian forest and upstream creek area protected by a conservation easement. The channel incision in the main Russian River has significantly affected Pistol Creek on this site and required a major restoration project following the January 1, 2006 flood. This 37-acre site encompasses a creek and grassland. This 108-acre site in the Windsor Creek watershed area has a number of ephemeral creeks. These creeks will be revegetated with native willows to reduce bank erosion. The Trenton Station Ranch straddles Trenton Road and includes several creeks. As part of their Fish Friendly Farming farm plan, the owners eradicated invasive, non-native blue periwinkle and Himalayan blackberry from riparian corridors and re-planted with native plants to increase wildlife habitat. The Slusser Road Ranch borders Mark West Creek where banks were planted with willow to reduce erosion.